Chubb Centurion Vaults give maximum protection for your highest value assets in the form of a walk in strong room or safe. These vaults are made from a series of lightweight modular panels and high security doors to compose the vault room construction. Both panels and doors are available with eight different security levels, all of which have explosives resistance. The highest levels also offer additional protection against diamond crown drill bits. The exterior of these vaults can be then be finished with plaster or clad with another material to suit the interior of your building or home. 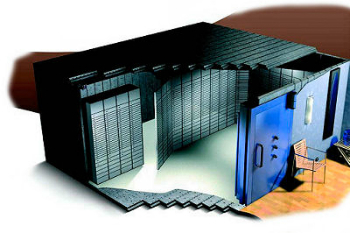 The vault door can be fitted with a grille gate providing added security for the main door. Can be integrated into various environments including new buildings, existing buildings or used to stregthen strong room units. Available with bespoke design to suit any shape or size (subject to comprehensive site survey). Available in a range of security grades (see the table below). If you would like to talk with one of our specialist advisers about our vaults – please call us today on 0117 967 4994. We can deliver and install your vault for you with minimum disruption.